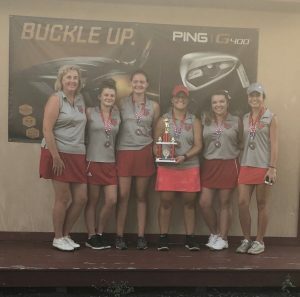 The New Palestine girls golf team won another Hancock County championship Tuesday, edging Mt. Vernon by 15 strokes for the title. The Dragons shot 177 over nine holes at Hawk’s Tail. MV shot 192, Greenfield-Central 202 and Eastern Hancock 271. Dragon junior Annaliese Fox was the individual champion, shooting a 38. She won a playoff with Mt. Vernon’s Alaina Nugent to claim the title. Izzy Gray finished third overall with a 42. Megan Diller tied for sixth overall, shooting 46. Abby Belgin shot 51 and Michaela Purnell 53. The Dragons are next in action Thursday at Lawrence Central. The Dragon golf team celebrates its county championship.